Captured from Fort Fisher, North Carolina, during the American Civil War. One of two guns that were a gift to the Confederacy from British sympathizers, it is the only one remaining. This other gun, which had been captured from Fort Caswell, seems to have been recycled during WW2. This gun has been at West Point, New York, since 1865. In American hands, the guns were somewhat less than useful, as their studded ammunition was complicated to manufacture, and the British rounds were hard to come by. 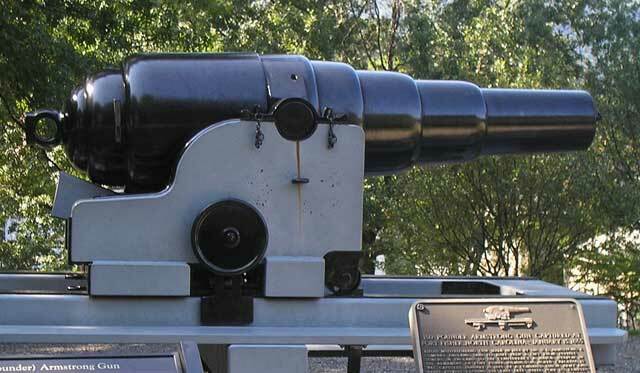 However, as a steel gun banded with iron hoops, it had a good reputation for accuracy and reliability, something Civil War cannon in general were not especially noted for.